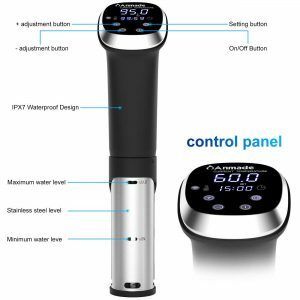 Anmade SV-610 is a sous vide precision cooker and immersion circulator with a 1000-watt power motor, modern Wi Fi technology and a digital LCD display that is IPX7 waterproof and includes precise timer and temperature control. This is a relatively new release kitchen appliance with a rating of 5 out of 5 stars by 7 customers on the day of this review. You can schedule your sous vide cooking with a stable app control and the Alexa or Google Assistance Voice. Smartife Application can be downloaded for scheduling or keeping track of the whole cooking process and the progress. You can control the sous vide cooker remotely through the data network. And you shall get notifications even when you’re away from your kitchen. Anmade Sous Vide weighs 2.99 pounds and measures 3.4 x 2.3 x 14.2 inches. It is capable of cooking bigger quantities of food with evenly distributed heat at stable temperature with a 1000W power pump and 8 LPM pump speed that circulates water efficiently 360 degrees through the water. 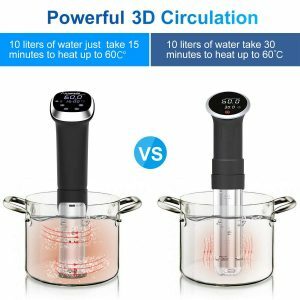 This three dimensional circulation technology and heating effect will help you achieve much better results and save you time. It is very easy to operate, as you attach it to the container you’ll use for cooking, put some water in and plug it in and start it. It is best that you use a vacuum bag and release the air after putting the ingredients in and place it in the water. You need to adjust the time and temperature for different food items and according to your taste. The Anmade Sous Vide is proven to heat up the 10 liter water to 60 degrees Celsius in about 15 minutes, which is half the time of standard sous vide cookers. This method of cooking where you cook slowly at low temperatures in a sealed bag helps keep more of the vitamins, minerals and other nutrients in the cooked ingredients with the precise time and temperature settings. The temperature will get to and stay at what you set it to throughout the cooking, with just a 0.1 degree Celsius error margin. You can change the temperature display from Celsius to Fahrenheit. The maximum time range is hundred hours, minus one minute. A large range of temp control is available on this sous vide unit: 20 – 95 °C (68 – 203 °F). It has an ergonomic grip- is comfy to hold and comes with security features like low water level and overheat protection mechanisms. You can cook tasty and healthy restaurant-quality meals- mains, entrees and desserts in your home kitchen. Once your ingredients are cooked, you don’t have to worry about removing the sealed bag from the water as there won’t be any overcooking. You don’t need to keep checking and it can stay in the water till you’re ready to eat. The insert is great quality surgical grade stainless steel, without any lead risk. The sous vide cooker won’t work unless the water is between the minimum and maximum marks. And it will turn itself automatically if the water goes below the minimum mark. There is not a specific type or size container you need to purchase. And you can use any container, lid and sleeve you prefer. The Smartlife app comes with a recipe interface that lets you choose the recipe depending on the food type and thickness. As you click the heating button, the temperature and time will be selected automatically. It is offered with one year of warranty and a 60-day money back guarantee if you’re not satisfied with the performance or whatever. You’ll get decent customer support and you can contact them with any comments or questions you may have.